Animals in traveling circuses are subjected to physical violence, insufficient living space, and other stressors. A newly reintroduced federal bill would protect these exotic and wild animals. Animal rights activists are applauding the reintroduction of the Traveling Exotic Animal and Public Safety Protection Act, which would end the use of wild and exotic animals in traveling circuses. Back in November 2011, Rep. Jim Moran unveiled the Traveling Exotic Animal Protection Act, marking the beginning of this bill’s journey. Then, the Traveling Exotic Animal and Public Safety Protection Act was introduced in the House of Representatives in November 2016 by Congressman Raúl Grijalva (D-AZ). The last action taken on that bill was in December when it was referred to the subcommittee on livestock and foreign agriculture by the House Agriculture. Grijalva recently reintroduced the bill with the help of Rep. Ryan Costello (R-PA) to make sure it does not go unnoticed by Congress. 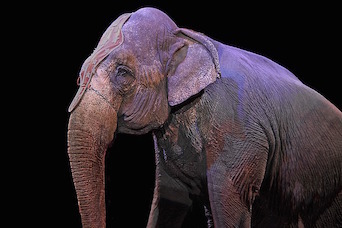 The new bill would amend the Animal Welfare Act and join the other 34 nations and 27 states in the United States that already prohibit the use of animals in circuses. The bill’s reintroduction was timed perfectly with the release of a new short film “The Reluctant Entertainers,” which features actors, musicians, and directors supporting the bill and discussing why a federal ban is necessary. Animal Defenders International (ADI), which works on various animal welfare and conservation issues, has provided evidence and assistance on the bill since its introduction. According to the organization, two-thirds of Americans are troubled by the use of animals in traveling shows. Besides the inhumane treatment, monitoring the welfare of circus animals and enforcing regulations is very costly. The Department of Environment in the United Kingdom estimates that the annual cost of inspecting the country’s 4 animal circuses ranges from $13,000 and $19,000. The United States does not break down the cost of circus regulation and inspection, but similar expenditures in America—which has about 6 times as many circuses and 38 times the land mass of the United Kingdom—would likely be far greater.